Your church lobby is often the first thing people see when they step inside. Is it time to brighten things up? 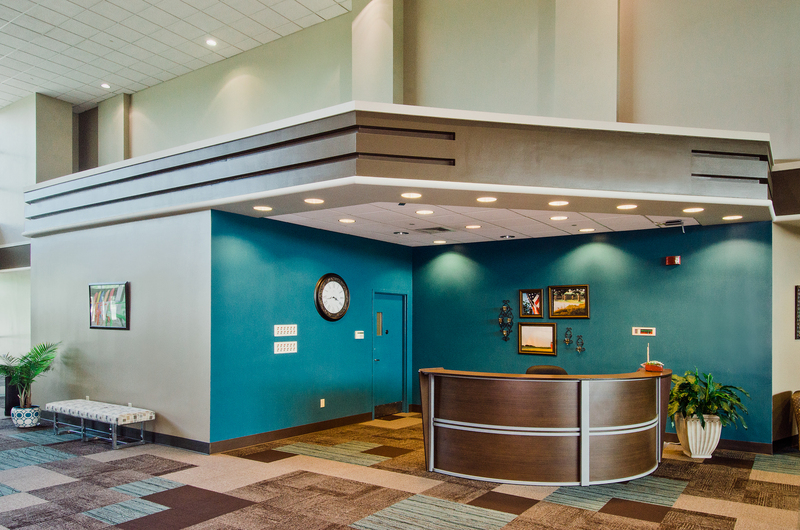 Does your lobby give people an immediate feeling of who you are as a church? Paint is such an easy and affordable way to change the feel of a space. You don’t even have to paint the entire lobby. You could pick a wall, soffit, door, or other surface and revive it a new, bright coat of paint. Don’t be afraid to stand out. Colors like bright yellow, lime green, orange or blue are popular right now and they definitely have a warm, energizing feel. Tip for color selection: When introducing a new color, look at the undertones in the main wall color or flooring. If there is already a yellow tint, pick a warm accent color such as red, yellow, and orange. If your main color has a cool tint, then choose cooler colors — such as blue, green, and purple. Walls are like giant canvases waiting for style and design. Don’t overlook the warmth and welcome of wall décor. Consider size and scale when choosing new wall hangings. Can the space handle large vinyl banners featuring your church logo and mission statement? Maybe you like the trendy look of recycling old wood pallets into wall features. Add textures and patterns. There are so many unique and creative wall elements that can easily accentuate your lobby design. Is it time for a carpet refresh? We can’t recommend carpet tiles enough. Carpet tiles are durable squares of carpeting that are made to lock down and look like one continual piece of carpet. It’s easy to install and it’s often used with different colors blended together in checker or mosaic patterns to create more unique looks. If you already have carpet tile in your lobby, consider popping out tiles in random locations and replace them with bright solid color squares. What type of furniture offerings do you currently have for available in your lobby? The more welcoming the environment is for social interaction, the more community you will be able to build on Sunday mornings. Maybe your lobby is in need of some new seating. Modern style furnishings with a brightly colored upholstery will add instant panache to your space. This one is the easiest thing you can do. Let the light shine! Instantly brighten your space just by using cooler color light bulbs. Also, make the most of every possible source of natural lighting by removing window treatments or anything obstructing sunlight from washing over the space. It’s also amazing how washing the windows will allow more light to filter inside. Don’t underestimate the value of a carefully thought out ceiling. Too often, the ceiling has been relegated to a stark, blank canvas begging for attention. Usually, the ceiling is the largest surface of uninterrupted space in an area, so its color or texture greatly impacts a room’s ambiance. Don’t be shy. Your ceiling can handle its own identity. 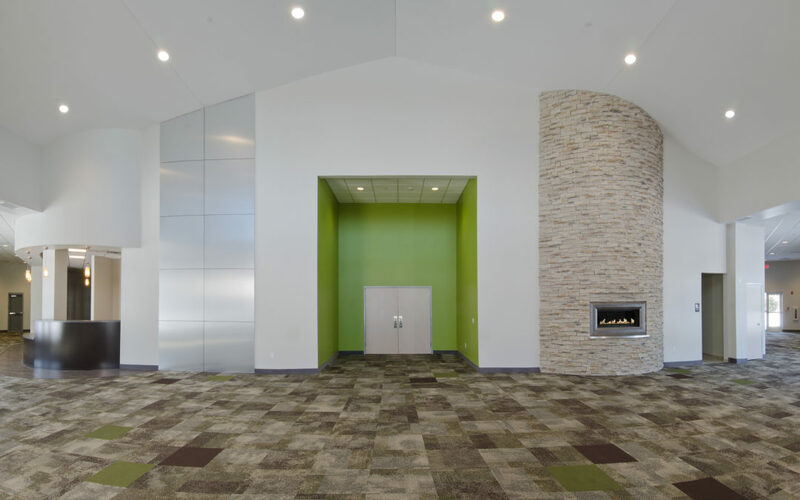 Add color and sound absorption with industrial felt panels hung vertically or horizontally to your ceiling. Reclaimed wood panels and beams create a cozy, rustic appearance and are a popular choice. There is also now a broad range of metal ceiling tiles in panels and planks. 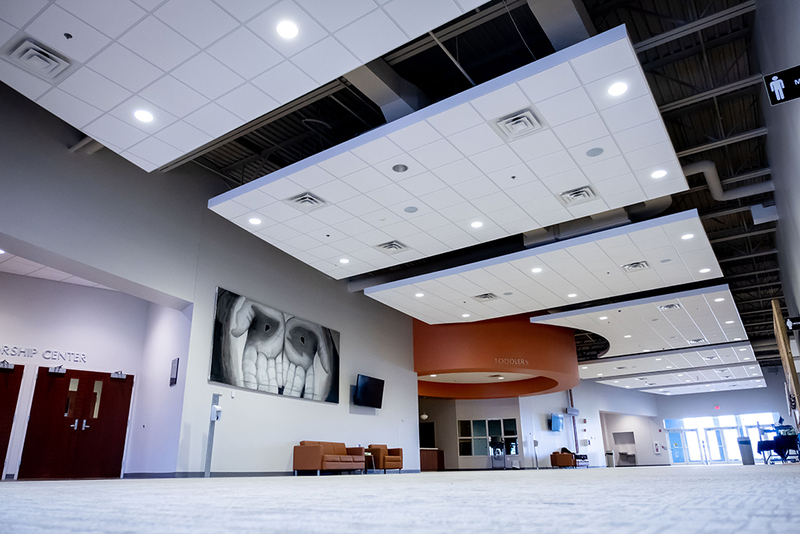 There are many ceiling options to consider that can instantly transform your lobby. The key to brightening your lobby is to make a BIG statement. Whatever you choose to change, make it a focal point. Be bold. Think about the difference between adding a bright green throw pillow onto a couch vs. changing the entire couch to bright green. The pillow is just a small accent, and if it doesn’t properly match the upholstery then it will look out of place; however, brightening up the entire couch is eye-catching and immediately transforms the whole room.